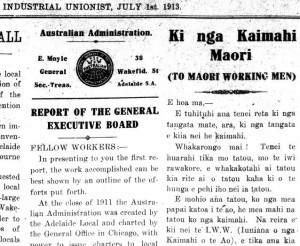 Exactly 100 years ago, in July 1913, the Industrial Workers of the World (IWW) published an article in their monthly newspaper titled ‘Ki nga Kaimahi Maori’. Percy Short, a painter from Johnsonville, started a series of articles in Te Reo for the revolutionary organisation. The IWW – te Iuniana o nga Kaimahi o te Ao – was founded in the US in 1905. Its famous preamble states that “the working class and the employing class have nothing in common. There can be no peace so long as hunger and want are found among millions of the working people and the few, who make up the employing class, have all the good things of life.”  Millions of workers across the world joined this revolutionary organisation that was opposed to dividing up workers by trades and instead favoured the ‘one big union’ for all. In Aotearoa, the first IWW branch was eastablished in 1908 in Wellington.2 In 1913, things really heated up for the IWW with a nation-wide speaking tour and the regular publication of the paper Industrial Unionist. With the start of the ‘Great Strike’ in late October the paper was published almost every three days keeping its four page format. Circulation reached 4,000 which was an enormous achievement for a small organisation with limited funds and radical ideas. E nga kaimahi o te Ao katoa, Whakakotahitia; kaore he mea e ngaro, ko te Ao katoa e riro mai – Workers of the whole world, unite; you have nothing to lose, you have the world to win. E tuhituhi ana tenei reta ki nga mate, ara nga tangata e kiia ana nei he kaimahi. Whakarongi mai! Tenei te huarahi tika mo tatau, mo te iwi rawakore, e whakakotahi ai tatou kia rite ai o tatou kaha ki o te hunga e pehi iho nei ia tatou. E mohio ana tatou, ko nga mea papai katoa i te ao, he mea mahi na tatou ko nga kaimahi. Na reira e kii nei te I.W.W. (Iuniana o nga Kaimahi o te Ao), e tika ana kia riro i nga kaimahi aua mea papai. Engari, kei raro i te ahuatanga o naianei e riro ana te nuinga o nga hua o te werawera i te hunga, e kiia nei he rangatira; Aa, he wahi itiiti noa iho e riro ana i nga mokai nana nei i mahi. He penei tonu te ahuatanga i nga whenua katoa i tenei ra. Kati, i mua, ki te mahi tetahi tangata, ka puta te painga ki te iwi nui tonu: ko te whakaaro o tetahi, te whakaaro o te katoa. Ko nga tangata o mua, ka mahi tahi, ka kai tahi, ka ora tahi, ka mate tahi. Kua rereke taua tikanga inaianei. I mua, na te iwi katoa nga mea katoa. Inaianei, kei nga rangatira anahe te oranga, ara te whenua, nga maina, nga tima, nga mihini nunui, nga tereina me era atu mea. Heoi ano te mea kei a tatou, he haere ki te pinono mahi ki nga tangata nana nei aua mea. Ko te kaupapa o to tatou oranga kua tahaetia e te hunga whaimoni. Kati, ma tatou ano e whakahoki mai ano te kaupapa o te oranga. Me pehea tatou e rite ai to tatou turanga ki to te hunga e pehi iho nei i a tatou. Koia tenei. Me huihui tatou ko te iwi rawakore e haere nei ki nga rangatira ki te patai mahi atu, me te mea nei kei te mau mai te tiini a tana rangatira ki o tatou kaki. Kei o tatou puku ke taua tiini e mau ana – te tiini o te hemokaitanga. Ka kore he mahi, ka kore hoki he kai. Hei aha ma te rangatira to hemokaitanga. No nga mokai ano tena mate. Na te Komiti o te pepa nei. This letter is written to the ones who are suffering, the people we call the workers. Listen! This is the correct path for us, the poor who have no possessions. We unite to gather our strength against the people who are suppressing us. We know that all the precious things in the world were made by us workers. Therefore the I.W.W. (the union of the workers of the world) says it is correct that the workers want to obtain all that is precious. However, under the current mechanisms, most goods produced with the sweat of the people are owned by what we call the bosses. Only a small portion is given to the slaves who do all the work. This is how it is in all countries of the world. In the old days, the work of one person went towards the well-being of everyone, of the whole tribe. The thoughts of one were the thoughts of everyone. The old people worked and ate together. They struggled together. They lived and died together. However, the tikanga – the custom – has changed completely. In the old days, everything belonged to everyone. Now all the wealth belongs to the bosses: the land, the mines, the ships, the big machines, the trains and a lot more. All we can do is go to the people who control our belongings and beg for work. Our wealth is being stolen by the money-chasers – the capitalists. It is through us that our wealth will come back to us. How can we prepare our stand against those who oppress us? This is how. We, the poor, who have to go to the bosses and ask for work, should meet and say we are chained around our necks by the bosses. A chain is tightened around our tummies – the chain of starvation. If there is no work, there is also no food. The bosses don’t care that you are starving. This struggle only affects their slaves. By the committee of this paper.